Joseph M.F. Ryan Jr., 80, a former Justice Department civil rights lawyer who sat on what became the D.C. Superior Court from 1960 to 1995, died of leukemia July 30, 2002, at the Bethesda Naval Hospital. He had homes in Bethesda, Maryland, and in Mexico. Judge Ryan was an associate judge in 1983 when he assumed senior status. He then heard cases -- many of them about so-called deadbeat dads and those involving child abuse -- until retiring in 1995. On the bench, he was known for his speed and direct demeanor. Judge Ryan also was a retired major general in the Air Force Reserve. He had served in the Army Air Forces in Europe during World War II and was detailed part of the time to the Office of Strategic Services. He received a certificate in physics and meteorology from the University of California at Los Angeles in 1943 and also was a photographic interpreter and weather officer during the war. Before retiring from the reserve in 1982, he served as reserve director of special investigations in the Air Force's Office of Special Investigations. His military decorations included the Distinguished Service Medal. 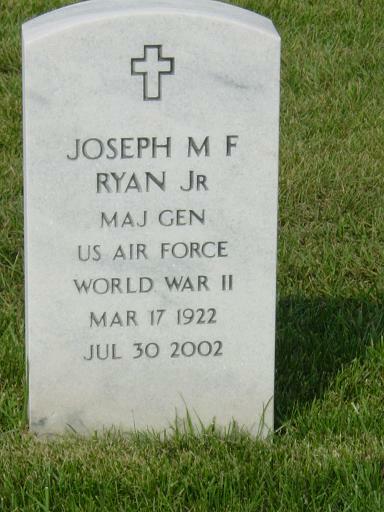 Joseph Michael Francis Ryan Jr. was a graduate of what is now Saint Joseph's University in his native Philadelphia. He was a 1950 graduate of Georgetown University's law school, where he also received a master's degree and was an associate editor of the Georgetown Law Journal. In the early 1950s, he was a law clerk to Chief Judge E. Barrett Prettyman of the U.S. Court of Appeals for the District of Columbia, an associate in the law firm of Hogan & Hartson and a lawyer with the House Ways and Means Committee. He later held positions within the office of the U.S. attorney for the District of Columbia, including chief of the civil division and director of research. In 1957, he became assistant attorney general in charge of the Justice Department's office of legal counsel. He was involved in the federal strategy of sending troops to Little Rock to enforce the racial integration of Central High School. Judge Ryan also played a role in setting up Justice's civil rights division, of which he became acting assistant attorney general before his appointment to D.C. Superior Court. His memberships included the Barristers, the John Carroll Society, the Reserve Officers Association and the Interallied Confederation of Reserve Officers (C.I.O.R.). His avocations included building model planes and trains. His first wife, Virginia Lee Guilfoyle Ryan, whom he married in 1956, died in 1974. Survivors include his wife, Maria Litsas Ryan, whom he married in 1988, of Bethesda; a son from his first marriage, Joseph Michael Francis Ryan III of Washington; two stepchildren, Teresa Halleck of Olney and Joan Siegel of Fairfax Station; and five grandchildren. RYAN, The Honorable JOSEPH MICHAEL FRANCIS, JR.
Stephen Halleck and Mark and David Siegel. Also survived by many loving family and friends. Friends may call at JOSEPH GAWLER'S SONS, 5130 Wisconsin Ave. at Harrison St. N.W., Washington, DC, on Tuesday, August 13, 2 to 4 and 7 to 9 p.m. Mass of Christian Burial at the Church of the Little Flower, 5607 Massachusetts Ave., Bethesda, MD on Wednesday, August 14 at 10 a.m. Interment with Full Honors to follow at Arlington National Cemetery.